Every year I go Christmas shopping to help one of my oldest friends to buy gifts for his family and we always drop in to see his mum on the way home to have a chat and a drink whilst wrapping the presents up. 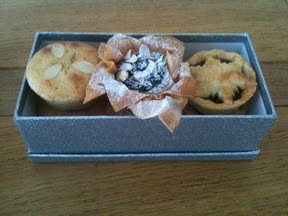 This year I wanted to take her some mince pies and decided to try a couple of recipes I've wanted to try for a while. The box I had to put them in was the right size for 6 pies so I decided that 3 different pies would be the perfect number. I made a normal mince pie with a snowflake top. A mince pie with a frangipane topping based on an alternative Christmas pie by @hollybellmummy and finally a filo and puff pastry number that was on a Jamie Oliver Christmas special a couple of years ago, but I'd never got around to trying. I started by making some short crust pastry. I sometimes put icing sugar in sweet short crust, which is a recipe I think I originally got from Mary Berry, but for mince pies I always use a basic pastry recipe my mum taught when I was very young, which was probably passed down to her from my nan. 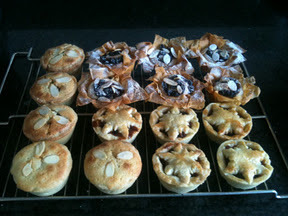 Whilst the pastry was resting in the fridge I started on the Jamie Oliver alternative mince pies. On a flours surface. 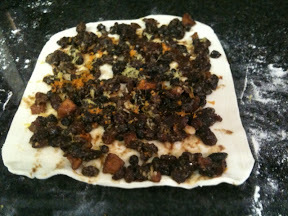 I rolled the puff pastry to a thickness of around 3mm and covered with a layer of mincemeat, lemon and clementine zest and dried cranberries. The original recipe also had chestnuts crumbled over but I didn't have any so did without. I put two overlapping squares of filo pastry in a greased muffin tin. Jamie just pushes the whole sheet into the holes but I thought it'd be neater to cut squares. I always use a bit of doughy off cut of pastry as a 'pusher' to encourage the pastry into the corners without tearing it with my nails. 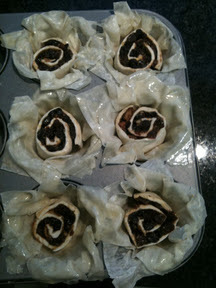 I then sliced the puff pastry roll into thick slices and placed one in each filo case. I finished off by brushing both pastries with melted butter and sprinkling the top with flakes almonds and icing sugar and popped in an oven preheated to 180C for about 30 mins. I found the filo started to go brown long before the puff was cooked so I places a piece of tin foil loosely over the top to prevent burnt edges. When they had cooled I finished them with another sprinkle of icing sugar. Whilst they were baking I made the frangipane topping by creaming together butter and caster sugar, gradually adding the beaten egg and finally stirring through the almonds to make a shiny paste. I then rolled out the pastry and lined greased muffin tins. I placed a heaped teaspoon of mincemeat in each case and topped half with a pastry lid in the shape of a snowflake (brushed with egg or milk for a shiny finish) and half with a spoonful of frangipane topping and three flaked almonds. I then baked them at 190C for about 20 mins. 1. Preheat the oven to 180°C/400ºF/gas 6. 2. Dust a clean work surface with flour and roll out the puff pastry into a big rectangle about 20x40cm/8x16 inch and 3mm thick. Thinly spread the mincemeat over the pastry, leaving a 1cm/½ inch gap around the edges and sprinkle with the cranberries and zest. Tightly roll up the pastry, lengthways, like a Swiss roll. 3. Take two muffin trays (for 12 cupcakes each) and butter each one lightly with the melted butter. Place two squares of filo pastry in each hole ease the pastry into each hole. Brush with the melted butter, then cover with a second layer of filo pastry. Brush with butter again. Tip: You can freeze the cooked, cooled mince pies in their trays (just wrap the lot in cling film) or in a plastic container. Just reheat them in a hot oven straight from the freezer. 4. 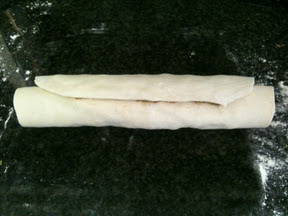 Take the puff pastry roll and, with a sharp knife, cut it into 24 slices. Place each slice, flat-side down, into a filo-lined hole. Brush with melted butter and sprinkle a few flaked almonds on top of each little pie, then pop both trays in the oven for about 25 minutes, until cooked and golden brown. 5. Leave to cool, then crack the individual pies out of the trays. Dust with a little icing sugar before serving. Rub the flour and butter together with your fingers until it resembles bread crumbs. Stir in the caster sugar. Add the beaten egg and gradually incorporate it all together being very light of touch until it forms a ball. Tip the ball of pastry into some cling film and rest in the fridge for about 30 mins. Cream the sugar and butter together. Mix in the beaten egg gradually and then stir in the ground almonds. What a wonderful box to receive! All the mince pies look delicious, the filo one is especially pretty! These look so pretty altogether in the box, a lovely present and must have been well received.